‘A building that embraces the traces of time without imposing a sense of difference on its neighbourhood’: this was the guideline suggested at the anchor facility design competition for Chungsin City Wall Village. For this project, which required the assembly of three buildings on different levels into one, the necessity to ‘preserve the original exterior’ while developing an appropriate programme and circulation plans were more difficult than one might think. This building is the winning proposal of a nominated design competition disseminated among public architects of Seoul Metropolitan Government (SMG). The project was launched by SMG, which planned to renovate the existing houses on three adjacent lots (1–165, 1–166 and 1–167 in Chungsin-dong) into an anchor facility for the local community. 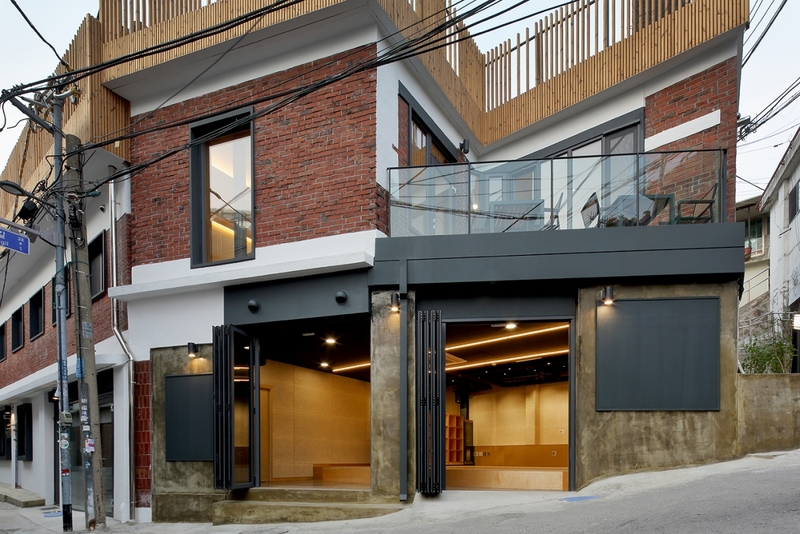 During the two-year design process, the Seoul Theater Association was chosen as an operator. 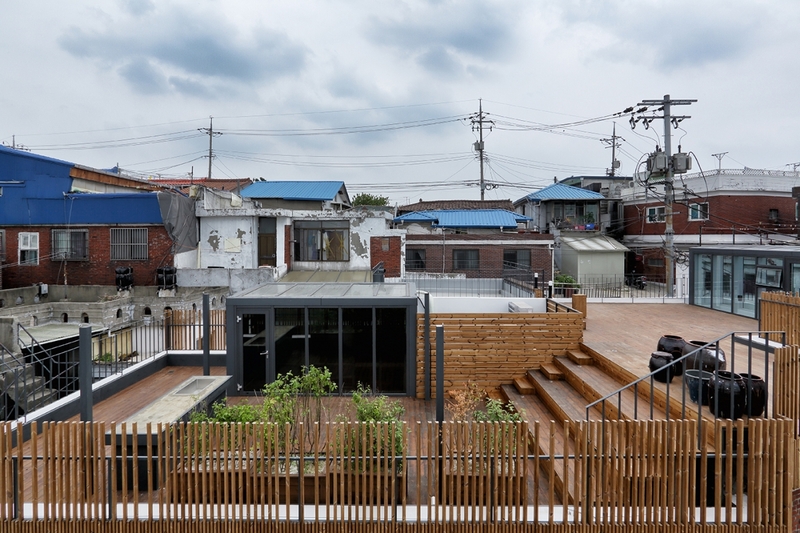 This determined the use of the remodeled building by defining it as a cultural and arts platform for theatrical people in Daehangno. And later, it was finally defined as Chungsin Theater Center, incorporating an artist’s guesthouse, a theatrical performance management office, and a community facility for locals. 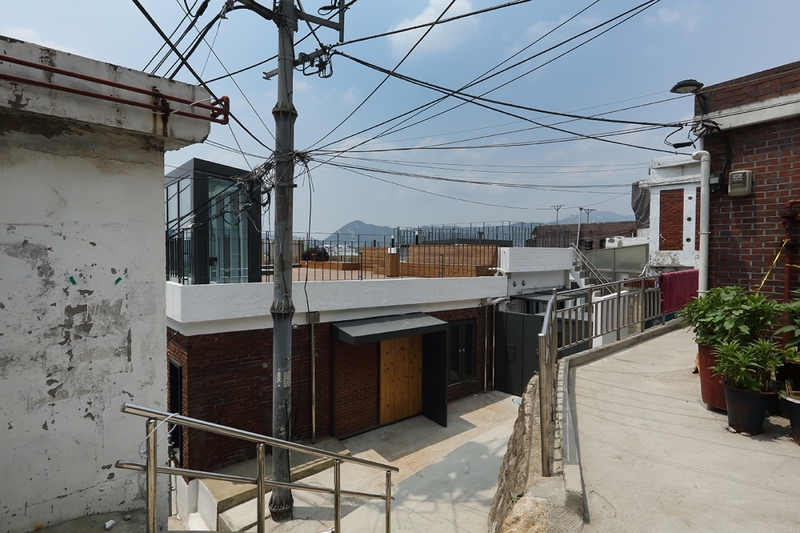 When I visited Lot 1–165 in Chungsin-dong for the first time, a beam of light pouring down in the courtyard of this ㄷ-shaped house left a strong impression and made me forget about the compact nature of the small house. 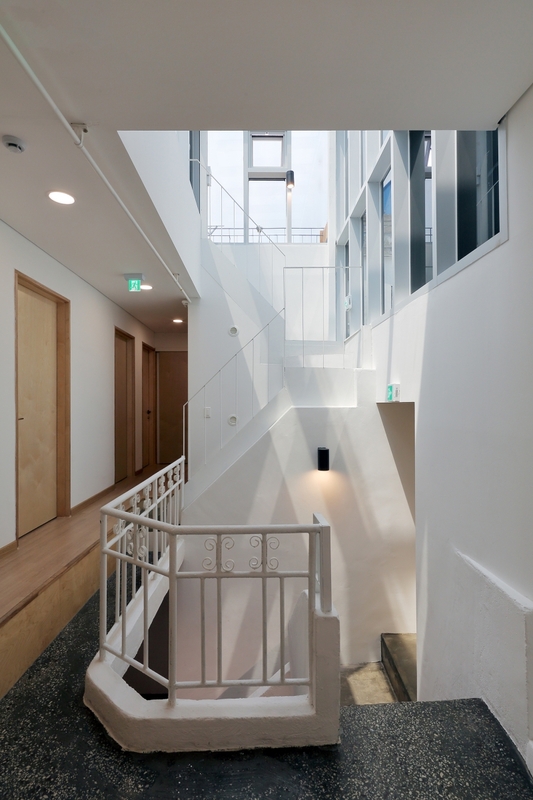 The light falls through gaps in the roof, which was installed to shut out the rain from the external stairs leading to the second floor from the courtyard. 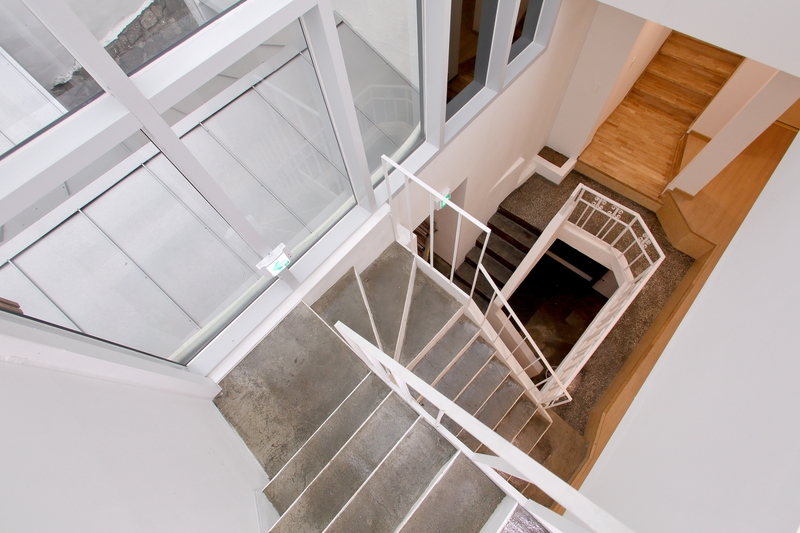 In Lot 1–166, a wooden hanok with a ㅡ -shaped floor plan, which was assumed to have been built in 1962 when the lot was subdivided, occupied the first floor. And on top of this, there was a masonry slab building (extended in 1978) that seemed to have been built very skillfully. The structure was very unique as it guided entrance to the building’s second floor from a cul-de-sac at the back of the road, and then go down to the first floor via the main gate. 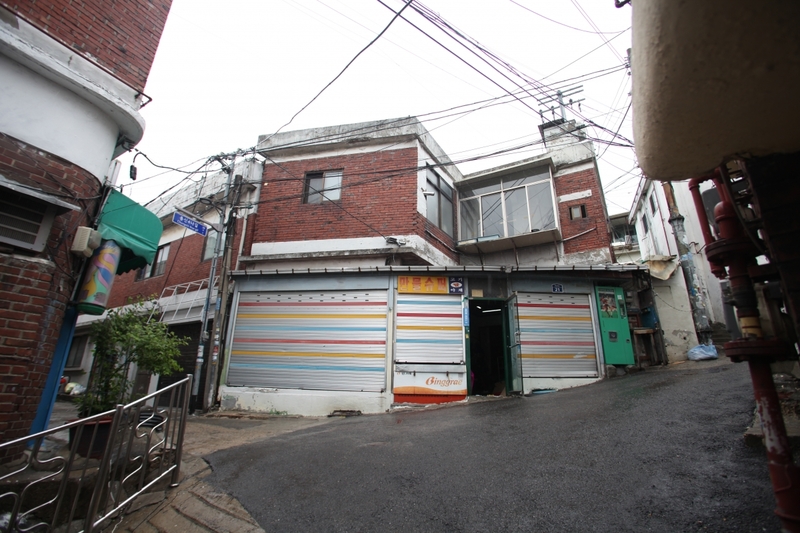 In Lot 1–167, there used to be the Manmul supermarket, which was a landmark in Chungsin-dong’s upper town. Its first floor was adjacent to a 4-metre road on the west, and on the second floor, with tiny rooms lining up on both sides of the corridor, there was an entrance in a narrow alley above the stairs on the east. To avoid imposing a sense of difference on the neighborhood through the dramatic transformation of building following remodeling works, it was decided that changes to the building’s exterior and external claddings would be kept to a minimum. The former supermarket building has maintained its original volume. The red masonry of the building front has also been preserved. The newly built outer wall of the first floor has been constructed using similar materials to the neighbouring buildings, and the same details have been applied to the windows to clearly show that the building is a single entity. The grinding finish of the ㄱ-shaped corridor and the metal balustrade on the second floor have just been repainted. The traces of the past have been left as they are, yet the courtyard is covered with a transparent glass roof so that it can retain its brightness and become an indoor space. Designed to embrace their own topographic conditions, the original three buildings had a level difference between each other as high as half a story. It was necessary to connect them in order to accommodate new programmes and enable the efficient use of space. Therefore, with the courtyard at the centre of these three buildings, new passages have been inserted to run across the buildings and then connect to the stairs. Connecting different buildings has resulted in a rich space over nine levels, which would have been unthinkable if it was a new construction project. The first floor office area of Lot 1–165 is linked with the first floor kitchen and management office of Lot 1–166 via the courtyard. The second floor courtyard of Lot 1–165 and the book cafe of Lot 1–167 are also linked through a passage in case the more office area is needed. The former supermarket site that shares its border with the road was designed as an open space. A stage has been added to host community activities or events. And an additional entrance has been installed to open direct access to the second floor from the alley behind the building. 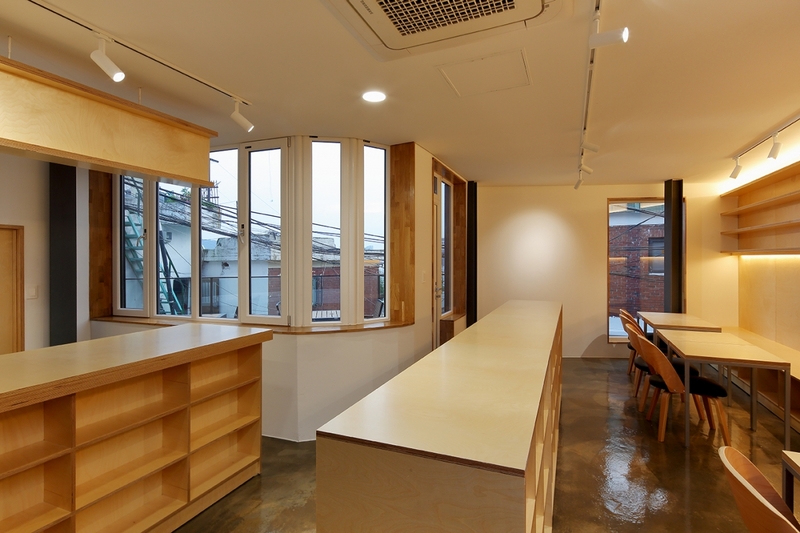 This allows people to use toilets and go up to the rooftop without passing through the book cafe on the second floor. On the rooftop, the level difference between Lot 1-165 and 1-167 has been used to efficiently construct stands, and outdoor sinks are installed too as it may come in handy when there is a performance, community festival or movie screening. Yi Jaehyuk graduated from the Department of the Architectural Enginnering at Sungkyunkwan University. 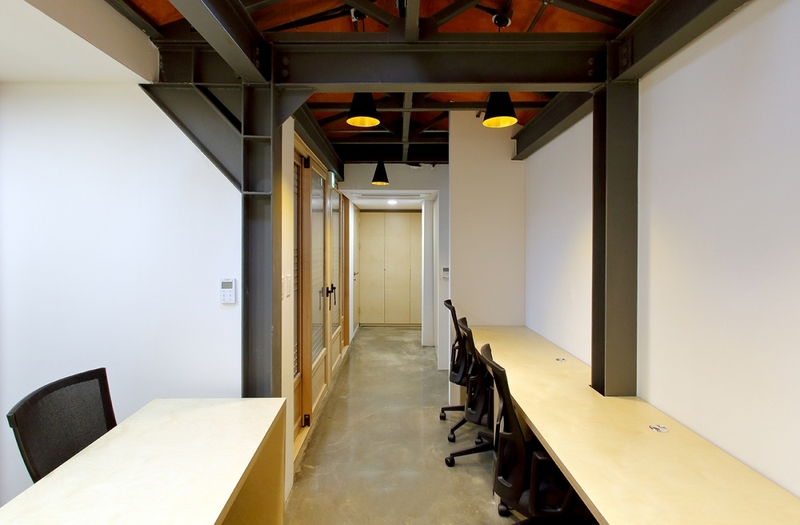 After working at SPACE Group and KC Architectural Lab, he founded admobe architect. He was awarded the KAI Young Architects Award (2004) from Korea Architects Institute, and the Seoul Architecture Awards (2008) for the remodeling of the Olympic Plaza. His major works include the remodeling of the Olympic Plaza, the Dongguk University Library extension, the remodeling of the Gahoe-dong office, among others.